What a brutal game of rugby, but man it was fun! I suspect that every one of us will have woken up on Sunday morning with stud marks and bruises and barely able to walk through the pain. It’s a good pain though. Knowing that you put your body on the line for your team and for your mates. And afterall, what hurts more, that or the pain of defeat? I know what I’d choose, every time. The return of our favourite local derby fixture. Both sides had strong squads of 20+ players and rolling subs were agreed. Weather was conducive to a free flowing and competitive game of rugby. Dry(ish) and not too windy. 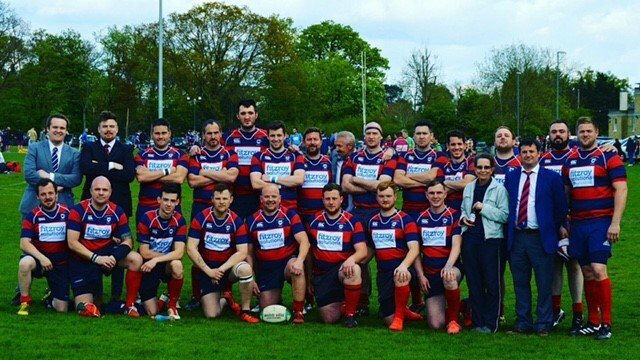 There were a lot of new faces in the Camelot team but I’m sure they all knew the history between the clubs and wanted to ensure bragging rights following a narrow Berko win earlier in the season (20-17 at Cow Roast). Berko had a debutant in Aaron Higgs, playing his first game for the club and thrown straight into a starting spot at centre. Berko started the game really well, with the bulk of the early ball and territory. We were pressing hard and sticking to the Captain’s game plan of pressure and possession. The Berko forwards were decent with ball in hand but some silly infringements at the breakdown led to repeated Camelot penalties and free kicks. Although we had them for power in the scrum, Berko kept getting pinged for the early shove and it started to hurt us. We knew very early on that we were getting nothing out of this ref and he wasn’t exactly aiding a free-flowing game of rugby. Nice bloke though. Possession was going to be key as the Camelot backs were spreading the ball well and favouring the crash ball in the centre. They were equally matched by Wordy and Farrell. Sorry, I meant Higgsy… Who kept a tight defensive line. Foxy was handling with comfort the penetrating kicks that Camelot were putting into our 22. The forwards were setting a decent platform for Charles and Lewis to work their magic, and that’s what led to the first Berko score. Paul Wakelin taking a crash ball to cross the whitewash. Conversion missed, 5-0 Berko. That lead didn’t last long as Camelot dug deep to make it 5-5 with the conversion missed. Still anyone’s game. We finally steadied the scums and more often than not, we drove Camelot off the ball on their own put-in. Our lineouts were going to plan. We kept it simple with the Frazer 2 ball. Either off the top or a catch and drive. Both options were working and Will and Tim got Frazer high to allow him to take clean ball. Good distribution allowed Marcus, Ben and Mitch to make some yards with clean ball out wide and it remained at 5-5 until a bit of brilliance saw Lewis cross to make it 10-5. A dazzling run by Chris Hickey, from our 10 metre line into the Camelot 22 saw the forwards secure clean ball for Lewis who dummied to cross. Conversion missed. Despite threatening their line on more than one occasion (both Vialsy and Hansard were held up on the line), we just couldn’t put any daylight between us and Camelot. A flutter of yellows saw four men sin-binned (2 for each side). Quite frankly, I don’t think any of these offences deserved more than a penalty. But, hey, I’m not the ref. We were dropping like flies. We’d lost Tim Brickle to a suspicious head injury and Matt Cain around the same time to an undetermined impact injury on his hand. But, at 10-5, It felt like were in the ascendancy and we’d cut out the silly mistakes that had been hurting us. Credit to Camelot, they dug deep and scored again to make it 10-10 (conversion missed). Still game on. We needed a hero… A match winner. They say, not all heroes come in capes, and ours come along in the form of Mitchel Ayres. Ball through hand and Mitch was there out wide to beat the last man and touch down to make it 15-10 to us with just 7 minutes remaining. Surely that was it…. Nope. Not quite. Soon after that try, we got a penalty in front of the posts. Step up Paul Wakelin who had finally found his shooting boots and took the pressure kick. 18-10 and we were two scores clear with no more than 2 or 3 minutes left on the clock. Still time for a bit more drama though. That score had made Peanut grumpy and when Peanut is grumpy on the rugby field, you’re better off being on his side. He battered our defensive line and eventually it broke, allowing another Camelot score. This time converted to make it 18-17 to Berko. Could this game be any tighter? Could we hold on for the win? The answer to that was YES. The whistle below and arms aloft, we celebrated a hard fought win. Well done all (opposition included). A lot of heart out there, not pretty at times but I’d guess a good watch from the sidelines. MotM. I suspect it was a tough call as there were so many great performances. Every single player put their body on the line vs Camelot. But Captain’s choice for MotM was Chris Hickey. Aggressive in defence and played a text book flankers game. Great at the breakdown and sniffed the ball out to make some dangerous breaks. *An amazing nudge over the Camelot defence to hit touch with pinpoint accuracy about 3 metres from the oppo tryline. Many are now suggesting that Dan Prince should be starting at 10 for Berko, or potentially playing rugby at a much higher level. Next up for Berko, Harpenden away. Already looking like good numbers for that.